ChainLink Research : Research :Compliance Rocks? Compliance reduces friction and cost in the supply chain: Lessons from the Vendor Compliance Federation. Does the topic of compliance make you glaze over? Maybe, but if you wanted to be a rock star in your firm, you would identify and deliver the one well-run business program that reduced cycle time, reduced DSOs (days sales outstanding), improved customer satisfaction, and assured data integrity (and more). And it would be—your compliance program! After listening to both retailers and suppliers—from the biggest to the smallest—talk about their issues and solutions for communication and collaboration at the Vendor Compliance Federation in Phoenix, I came away with a renewed enthusiasm for the topic of compliance. VCF always puts on an educational event with lots of things to learn, if attendees dig in (which they do). I don’t know anywhere else where this kind of nitty gritty dialogue—supplier-to-retail, or supplier-to-supplier—can take place. And the setting certainly gives the hard working compliance folks a break, too! EDI, Barcodes, Labels and Tickets! I heard Interesting comments from many suppliers who were brimming with ideas to help their customers to improve data quality and delivery performance in the supply chain by using Electronic Data Interchange (EDI), process improvements, and things like fast-tracking (internet-based ticketing).1 One supplier said that they cut weeks off their lead times by this method. Another talked about errors in the ticket layout sent by the retailer. Correcting the errors added 4 weeks to the lead time to ship otherwise floor-ready merchandise. That’s a whole month of lost sales and lost cash! She told me that FastTrak, provided by a firm called FineLine, (that she uses with her other retail customers) could have avoided that. EDI? That’s so yesterday! Really? 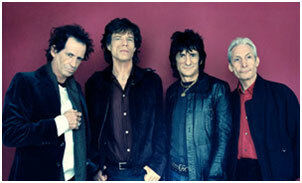 Do you still like the Rolling Stones? Did you try to get tickets to that sold-out Eric Clapton concert? EDI may be getter older, but it’s not going away. In fact, the market continues to grow each year (and the Stones keep getting richer). Not only is EDI the preferred method of all the big channel dominators across the globe, but the methods and protocols keep becoming more information rich and industry specific. Used correctly, EDI can provide a method for improving your cash position and improving your customer satisfaction metrics: as well, it can enhance authorization and security in your business transactions and shipments. 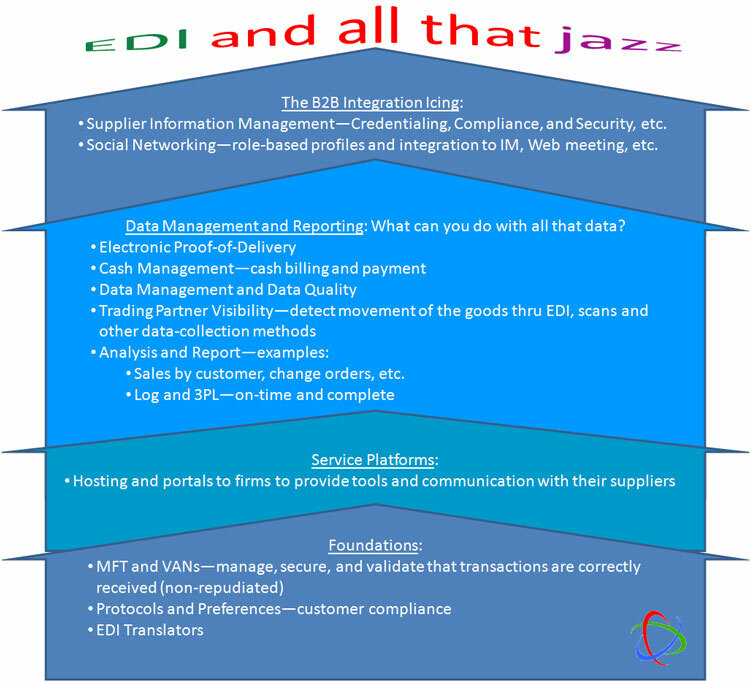 EDI has had a face lift in the last few years, both in approaches with AS2 and in leveraging the information encased within the EDI transactions. Providers today have a rich array of B2B capability (see Figure 1: B2B/EDI Environment) that is not just about data, but also the people managing the process—the social network and supplier identity system. AS2—Organizations like Amazon and Walmart use AS2. “AS2 (Applicability Statement 2) is a specification standard by which vendor applications communicate EDI or other business-to-business data (such as XML) over the Internet using HTTP,4 a standard used by the World Wide Web.”5 AS2 guarantees delivery/non-repudiation of the data. This bypasses the VAN (Value Added Networks). Organizations can use MFT software or services to send their various B2B communications, whether EDI, document files, HTML, etc. CLEO comes to mind for this application. Leveraging EDI—DiCentral, which is rapidly becoming a super-size player in this market, is an example of leveraging the rich data content within EDI transactions to create a supply chain visibility solution. Shipments can be tracked by being scanned at each stage in the logistics process from the time of purchase; during shipment, with Advanced Ship Notifications (ASN); until end receipt. We have seen this approach in the Pharmaceutical industry, with ValueCentric able to address major challenges from manufacturer to Pharmacy; and in Retail for small suppliers, with RedTail, using EDI to report on sales. Social Network—we have been discussing the value of Social Networks (video interview here - Supply Chain Brain login) in the supply chain and how technology companies are now providing it for their customers. GSX told me about their strategy with RollStream.6 Authentication of data and credentialing of suppliers is becoming a very important issue in the supply chain. So, master data is not just about the transaction but who (both the company and the person) is sending that transaction. Conclusion—Compliance and Performance Rock Stars? So, do you rock? How well are you collaborating with your trading network? The results will be revealed in performance data. How well are you doing on these critical performance requirements: on-times, fill rates, using your customer’s routing guides? How about predictive alerting or avoiding noncompliance situations? Before those nasty noncompliance activities occur, ComplianceNetworks can detect, alert and correct. The outcome is avoiding chargebacks, reduced DSOs and increasing cash and profit. So, are you delivering the perfect order? 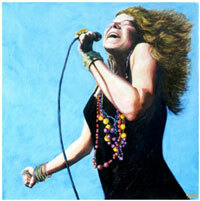 Compliance is not just merely a back-up singer, but one of the ROI Rock Stars. The music business, as we know, coveted the performer who could deliver the audience and the dollars. So, will you be one of those for your company? Can you be that performer? If you like this type of discussion, I point you to the EDI LinkedIn group: EDI-Electronic Data Interchange. Very up-to-date dialogue on B2B and EDI. 1FineLine provides internet-based ticketing which can create and produce tickets in a matter of hours, as compared with traditional approaches which can take weeks.